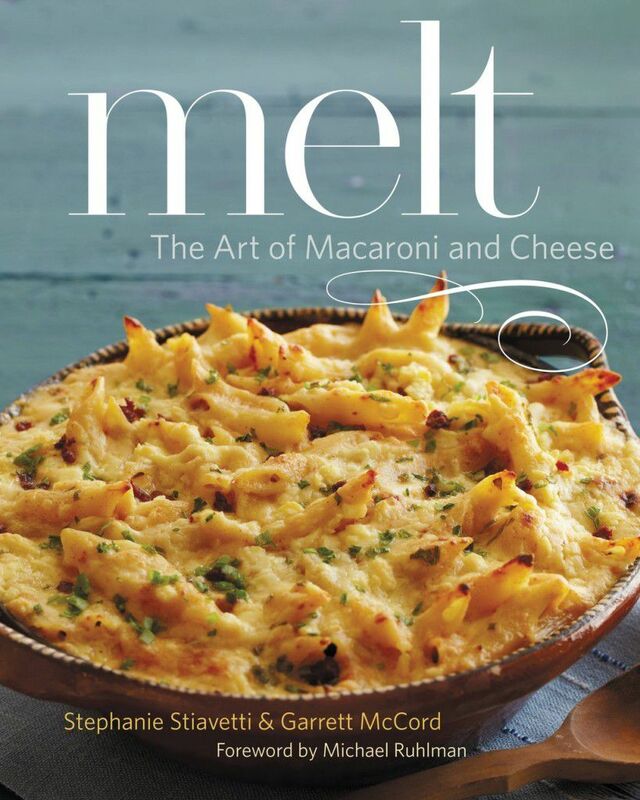 One of our favorite Sacramento food bloggers, Garret McCord, recently teamed up with San Francisco food blogger, Stephanie Stiavetti, to create a cookbook that marries the standard American macaroni and cheese with handcrafted artisan cheeses and a wide array of pastas. The incredible cookbook features some traditional combinations as well as some unexpected and delicious combinations, such as Beecher’s Flagship Cheddar with Avocado, Lime, and Shell Pasta; Drunken Goat, Fennel, Edamame, Mint, and Rotini; and Pumpkin Stuffed with Fontina, Italian Sausage, and Macaroni. Scroll down to read about Garret’s cooking inspiration and tips, as well as an exclusive recipe from his cookbook! What inspired you to create this cookbook? Garret: There’s a lot of great artisan cheese out there, but so many people are nervous around it. They don’t know what to buy or really, even, what they are buying. Melt was the chance to introduce people to great cheese through something that they are familiar with; that being mac and cheese. At what age did you start cooking? Who inspired you to cook? Do you have a favorite recipe from the book? Garret: My favorite changes day to day. Though today I’m kinda pining for the roasted pumpkin stuffed with fontina, sausage and pasta. It’s a perfect cold weather recipe using seasonal produce. Plus, it’s so forgiving to changes that you can use whatever you have in the house and make a truly outstanding dish that wows your eaters. What’s your #1 tip for someone that’s a beginner at making mac & cheese? Garret: Warm your milk before making a mornay sauce. Seriously, it’ll speed things up significantly and you won’t spend twenty minutes stirring over the stove. Preheat the oven to 350°F/178°C. Cut a circle from the top of the pumpkin at a 45-degree angle, the way you would cut open a pumpkin to make a jack-o’-lantern, and set aside. Scoop out the seeds and strings as best you can. Generously salt and pepper the inside of the pumpkin, pop the top back on it, place it on a rimmed baking dish (since the pumpkin may leak or weep a bit), and bake for 45 minutes. Meanwhile, heat the olive oil in a sauté pan over medium heat. If the sausages are in their casings, remove the meat and discard the casings. Crumble the sausage meat into small chunks and cook until lightly browned. Remove the sausage from the pan with a slotted spoon and set aside to cool. Discard the drippings, or save for gravy or what have you. Also while the pumpkin bakes, cook the pasta in a large pot of salted boiling water until al dente. Drain through a colander and rinse with cool water to stop the cooking process. In a bowl, toss together the Fontina, Gruyère, sausage, pasta, scallions, and herbs. 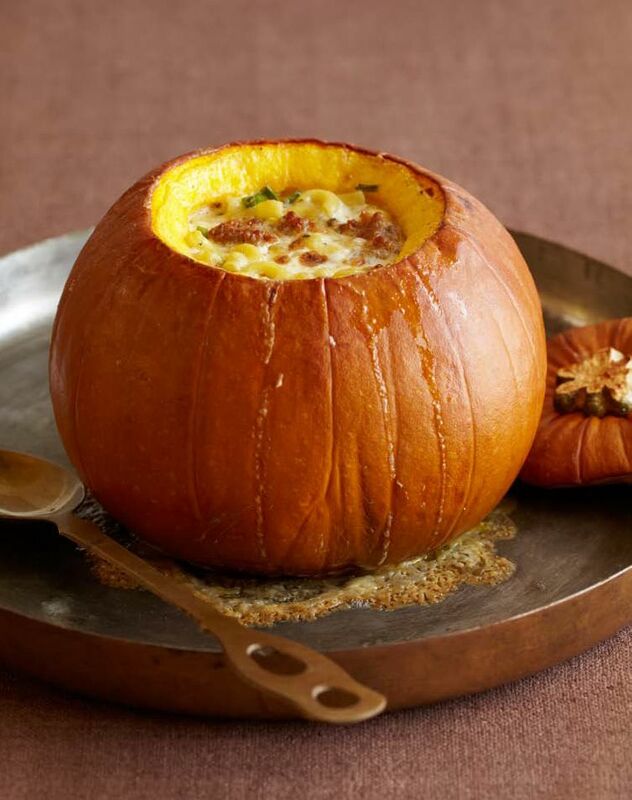 Once the pumpkin is done baking, take it out of the oven and fill it with the macaroni and cheese. Pour the cream over the filling. Place the top back on the pumpkin and bake for 1 hour, taking the top off for the last 15 minutes so the cheese on top of the filling can properly brown. If the top cream still seems a bit too wobbly and liquid, give it another 10 minutes in the oven. The cream may bubble over a bit, which is fine. If the pumpkin splits while baking, as occasionally happens, be thankful you set it in a rimmed baking dish and continue to bake as normal. Allow the pumpkin to rest for 10 minutes before serving. Be careful moving the dish, as the pumpkin may be fragile. You can serve this dish two ways: Cut it into sections and serve them, or just scoop out the insides with scrapings of the pumpkin flesh for each serving. Either way is just dandy. Salt and pepper to taste.